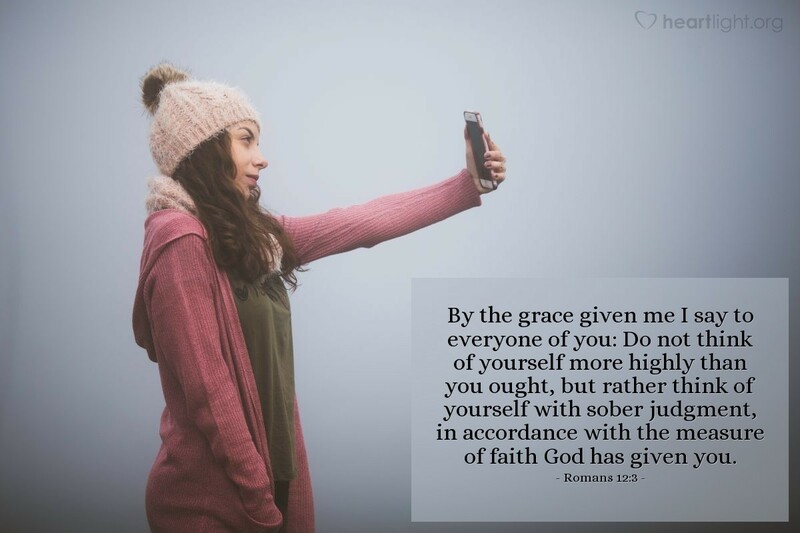 By the grace given me I say to everyone of you: Do not think of yourself more highly than you ought, but rather think of yourself with sober judgment, in accordance with the measure of faith God has given you. Pride does go before a fall! Try balancing these two truths: "I must not be prideful, but I must understand just how much God values me." It's not easy. Satan can use our self denigration, what I call the worthless worm syndrome, to discourage us and keep us from using our gifts and knowing our value to God for Kingdom work. On the other hand, pride takes God out of the picture and attributes any contribution to God's Kingdom to us and not to God. To be both bearer of the image of God and part of fallen humanity is more than a theological issue; it is the daily struggle of being a disciples. But we maintain the proper balance by praising the One who made us his child and adopted us into his family. Holy Father, as your child, redeemed at the cost of Jesus' life, I know I am loved and valuable to you. I know you have given me abilities and gifts to use for your glory and to bless your church. But Father, I do not want to ever think that my abilities are somehow tied to my superiority or work. I know you have given me the gifts, abilities, and experiences that have shaped me, so please empower me to your glory. But Father, I never want the glory that is achieved from your gifts to puff me up or rob from me the realization that I am what I am, I have what I have, and I do what I do, because of your grace and your generous gifts. May I ever be your humble but valuable child at work in your Kingdom. I pray in the name of Jesus, my older brother and your Son. Amen.